Soon after Meghan Markle became the newest member of the British royal family, her reported fondness for a Maybelline mascara seems to have given the makeup brand a lift among young women. It all began on May 23, when Markle’s former makeup artist told a reporter that the Duchess of Sussex’s favorite mascara was Maybelline’s Lash Sensational Luscious Mascara. As publications such as Allure and Teen Vogue echoed this news, data from YouGov BrandIndex shows that consumer sentiment toward Maybelline increased among female shoppers aged 18-34. On May 22, for example, Maybelline had an Impression score of 30 among millennial women. About a month later, that score has climbed to 43. According to figures from YouGov Profiles, 21% of women aged 18-34 agree that celebrity endorsements have an effect on their purchasing decisions, compared to 11% of women aged 35 or older. For millennial women who have either a neutral or positive opinion of Markle herself, this level of agreement is even higher: 25%. 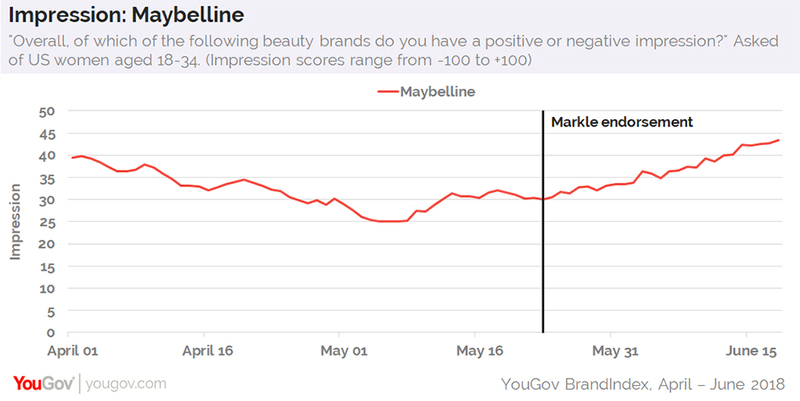 Given this general attitude toward celebrity endorsements, YouGov data also reveals an increase in Purchase Consideration for Maybelline among the same demographic. On May 22, when asked if they were open to buying from the makeup brand when next in the market for beauty products, 29% of US women aged 18-34 said they were. After news spread that Markle prefers a mascara by Maybelline, that percentage has increased to 39%.